MultiTouch Ltd. will be showcasing MultiTaction iWall at InfoComm 2014, taking place June 18-20, 2014 in Las Vegas. This 16’ by 9’ turnkey interactive video wall will be at MultiTouch’s booth N1463. At InfoComm, MultiTouch will also debut its partnership with Bluescape, a cloud-based visual collaborative workspace provider. Both MultiTaction iWall and Bluescape’s solution utilize the MultiTaction Cell 55” with Ultra-Thin Bezel displays as the hardware platform but it is the applications on these installations that show the features of MultiTaction products. Bluescape’s software highlights the real-time collaboration in distributed decision making, planning and design whereas the MultiTaction iWall is a presentation platform for corporate public spaces and other high-value locations. 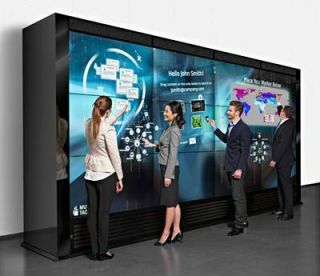 The MultiTaction iWall is made possible by MultiTouch’s patented Computer Vision Through Screen (CVTS) technology: unlimited simultaneous users; concurrent touch, pen and 2D barcode tracking; Enriched Reality object recognition; and MultiTaction Codice user identification. The result is a combination of 24 megapixel on-screen resolution, capability to run multiple concurrent 4K videos and the ability for users to send all the content on MultiTaction iWall to their emails, directly from the screens. At InfoComm, MultiTouch will also highlight new hardware and software features supported by MultiTaction displays. MultiTouch is now fully supporting table orientation for its 55” Ultra-Thin Bezel displays. MultiTouch is also showcasing the capability for asymmetric installations with an L-shaped interactive reception desk built using three 42” MultiTaction Cells. MultiTouch’s software highlights include free MultiTaction Cornerstone 2.0 SDK for application development using native MultiTaction; TUIO or Windows Touch compatibility; and a new TUIO import feature supporting third-party touch displays with MultiTaction Cornerstone.